had always essentially been a ‘police-army’ enforcing Dutch rule. Its theoretical mobilisation strength was 85.000 but effectively it consisted of fewer than 25.000 fighting soldiers equipped with obsolete rifles and insufficient ammunition. All that was available to support them were a few Artillery regiments, 7 recently delivered M4 tanks without cannon, a handful of light tanks (Marmott – Harringtons) and some flimsily armoured cars. With this inadequate equipment they had to face the ‘Nanjo’ Army Group consisting of 4 Armies with a combined strength of over 15 divisions, totalling over 150.000 soldiers, supported by light tanks, heavy artillery and, above all, effective air power. The KNIL ground forces fought bravely and stubbornly but were unable to stop the fast moving, well prepared Japanese troops, who used smart tactics. The lightly equipped Japanese Infantry commandeered bicycles from the local population and sped ahead, supported by their Air Forces that dominated the skies. Thus they covered long distances using the well-designed roads built by the Dutch government to serve the incredibly rich plantations. This mobility was the undoing of the Allied defensive strategy. Hampered by their outdated equipment and their lack of combat experience, the KNIL forces simply could not fall back and regroup fast enough to prepare a real defensive perimeter. Apart from the KNIL forces, the only relatively modern fighting unit in Java was the ‘Blackforce’. It consisted of some 2300 Australian troops commanded by Brigadier General A.S. Blackburn. They had some light tanks and a machine gun regiment. This force was augmented by artillerymen, truck drivers, medics, clerks and downed airmen. It deployed February 27, 1942 at Buitenzorg (now Bogor, 60 miles west of Bandung). After the official surrender was signed on March 6, 1942 (much against Blackburn’s advice) the ‘Blackforce’ was finally rounded up by the Japanese armies in Java. Attached to the ‘Blackforce’ was the 2nd Battalion, 131st Field Artillery US Army, commanded by Lt. Col. Blucher S. Tarp. This north and central Texas National Guard unit was the only United States ground unit to fight in the Netherlands East Indies. It has later become known as ‘The ‘Lost Battalion’. From Australia came the 2/40th Battalion AIF “Sparrow Force”. It consisted of 1300 Australian troops under command of Lieutenant-Colonel William Leggatt and arrived in Kupang, Timor Island from Darwin Australia in December 1941. They were to assist the Netherlands East Indies Army to prevent the pending invasion of Timor by the Japanese Imperial Army. For over a month the Australians and Dutch fought well but the overwhelming strength of the Japanese invaders gradually wore them down. Finally surrounded by the enemy, the Japanese gave them one hour to capitulate. Otherwise they would be obliterated by tanks and aircraft. After this ultimatum the remnants of the ‘Sparrow Force’ surrendered at Usua on February 23, 1942. Attached to the ‘Sparrow Force’ was 2/2nd Independent Company, a predominantly west-Australian commando unit led by Major (later Lt. Colonel) Alexander Spence. This unit was specifically trained in ‘stay behind’ operations and guerilla tactics. After the surrender of the ‘Sparrow Force’ its HQ Company and a number of Dutch army personnel somehow managed to join the 2/2nd. It meant a reinforcement of some 290 men. From the end of February until late August 1942 the Australians and Dutch carried out guerilla operations against the Japanese, using the Portuguese Timor Mountains as their base. In September 1942 they were reinforced by the 2/4th independent company as well as 190 fresh Dutch troops. The harassment of the Japanese continued to such an extent that the Japanese diverted a complete division to Timor. However, by the end of 1942 it was obvious the Allies would not be able to invade and re-take Timor soon. 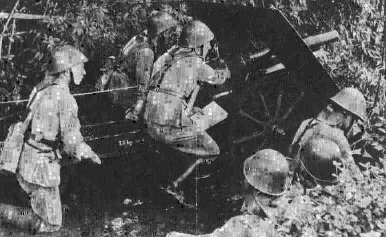 Resources were desperately needed to fight the Japanese on beachheads around Buna in New-Guinea and the decision was taken to wind the campaign down. The Australian and Dutch forces were gradually evacuated during January and February 1943, ending a year-long guerilla war. The relatively small Australian force has inflicted a disproportionate level of casualties on the Japanese. But perhaps its most significant achievement was the tying up of a complete Japanese Army division (the 48th, commanded by Lieutenant General Yuitsu Tsuchihashi). This division was sorely missed by the Japanese army command during the battle for New-Guinea.